Ayurlog: National Journal Of Research in Ayurved Science (NJ-RAS) is a peer-reviewed, open access electronic journal published by Dudhamal publication (OPC) Pvt. Ltd. The Journal provides a forum for research workers in Ayurved field on current issues and challenges of society regarding their health awareness and diseased conditions. The aim of Journal is to publish research articles on Ayurved. 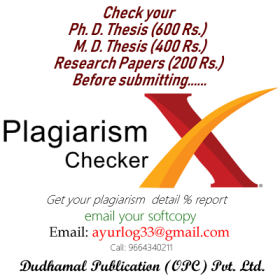 The mission of the Journal is to publish advanced theoretical and empirical research in Ayurved with the noticeable contribution and impact to the development of this discipline and preferably with practice relevancies. EFFECT OF DASHMOOLA TAIL ANUVASAN BASTI ON UDAVARTA YONIVYAPAT W.S.R. TO DYSMENORRHEA – A Case Study. To study the views of doctors on heavy metal poisoning in Mumbai. Clinical Efficacy of Ayurvedic Management in Digital Eye Strain and Visual Fatigue. : Clinical Efficacy of Ayurvedic Management in Digital Eye Strain and Visual Fatigue. Role of Vamana Karma in the management of Urdhwaga Amlapitta. "Vyadhi Vyavashedatmak study of types of Grahani Vyadhi by evaluating Samprapti"
Critical review of medovridhi (obesity) due to sedentary life style and junk food. "A literature review on “Triphala’s Rasayana Karmukata." A critical Review on dominant Vata dosh in Tridosh siddhant. A clinical trial of feeding tube with metallic guide wire insertion for ‘Ksharsutra’ technique in a case of fistula in ano. A clinical study to evaluate the efficacy of Sahachar and Nimba Taila Shiroabhyanga in the management of Darunaka. cauterization, Dhatakyadi yog, post op fissurectomy wound, grading criteria, shodhan and ropan. A Single Case Study To Evalute Efficacy Of Tamra Bhasma On Hypothyroidism. Our Ayurvedic Books on Google play store free for download! Publish your book on Google play store in Three Thousand Rupees (3000 Rs,) only! !